I run a weekly African marimba music class near Bethnal Green in central London every Wednesday from 6-7:30pm, and I also teach at cultural events, festivals, schools, team bonding days, diversity day events and black history month programmes, to name but a few. Have a browse below for some more information, or use the contact tab below to get in touch. The marimba is a wonderful classroom instrument that gives a multitude of learning experiences. Apart from being fun, playing in an ensemble boosts confidence, encourages both creativity and concentration, and it teaches participants to listen to one another and work together to produce a harmonious sound. Engaging your senses through music and rhythm is a great vehicle for cross cultural dialogue and understanding. It's especially relevant for Diversity Day / Black History Month programmes. Participants get to learn about the rich histories of the African continent through music - in a fun, hands-on and interactive way. 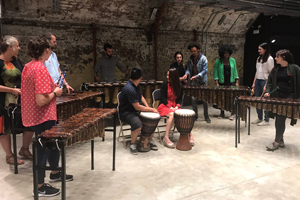 Using soprano, tenor and baritone marimbas to form an ensemble, work teams get to bond over southern African rhythms, sharing in the co-creation of lovely music. Marimba workshops are great fun and can include a bit of singing, clapping patterns and some simple traditional African dance moves! It's a great way to bring any team closer together. Weekly group classes run every Wednesday evening at Saint Peter's North Community Centre in Bethnal Green, from 6 - 7:30pm. £10 per person. Advance booking is required. All ages and musical abilities welcome! Use the tab below to learn more and/or to sign up for a Wednesday class. One-on-one classes are available on Saturdays at Saint Peter's North Community Centre in Bethnal Green where the diary permits. Advanced booking is required. I am also available to travel to you with the instruments for a private individual or group workshop at a venue of your choice. Use the tab below to learn more and/or to register for a private class.